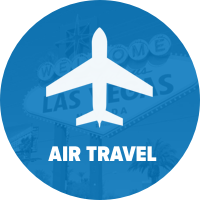 Travel by Air: Las Vegas is serviced by McCarran International Airport (LAS), which is located directly east of Las Vegas Boulevard and south of Tropicana Avenue. It is about a 10-minute drive to the heart of the Strip, depending on traffic. Most airlines provide direct or connecting service to the city; Southwest Airlines offers the most flights in to and out of Las Vegas. Connecting hubs that provide the most frequent flights include Los Angeles, Salt Lake City, Denver, San Francisco and Dallas-Fort Worth. We have partnered with United Airlines to offer travel discounts to SHRM19. Visit www.united.com/meetingtravel and enter Z CODE: ZGQC AND AGREEMENT CODE: 188812 in the Offer Code box. Booking fees are waived for Meeting reservations. Please note: Travel must be booked between 6/16/2019-6/30/2019 in order to receive the discount. Taxi: The average taxi ride costs $12-24. Taxicabs are available on the east side of baggage claim, outside door exits 1-4. Airport personnel are available to help queue the lines and provide assistance as needed. 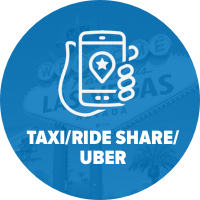 Ride Share/Uber: Uber and other shared ride services are available at the McCarran International Airport. Terminal 1: From Baggage Claim, take the elevator near door #2 up to level 2. Cross the pedestrian bridge on level 2 to the Terminal 1 Parking Garage. The ride share pickup is located on level 2M of the parking garage. Terminal 3: From Baggage Claim, take the elevator near door #52, #54 or #56 up to level 1. Cross the pedestrian bridge on level 1 to the Terminal 3 Parking Garage. The ride share pickup is located on the valet level of the parking garage. The average cost for an UberX (up to four passengers) is $7-10 and for an UberXL (six or seven passengers) is $8-20. There are two interstate highways that run through Las Vegas: I-15 and Highway 95/Highway 93/I-515. The two run nearly perpendicular to each other, making a big X across the city. They intersect just north of the Las Vegas Strip. I-15 begins in Los Angeles, enters Las Vegas in the southwestern corner of the city, travels parallel to Las Vegas Boulevard and continues north through the city. It exits in the northeast corner of the city and continues on toward Salt Lake City, Utah. I-515 is better known as I-95 in the city, though it is also Highway 93. It enters the city in the northwest corner and heads toward the southeast section of Las Vegas. It goes through Henderson then loses it’s interstate status and becomes a two-lane highway as it passes through Boulder City, past Lake Mead National Recreational Area, across the Hoover Dam and into Arizona. 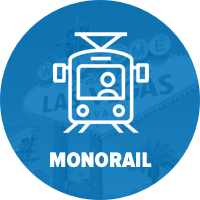 Las Vegas Monorail Info: In just minutes, the Las Vegas Monorail connects you to the city’s glitz and glamour of world-class restaurants, shows, shops, clubs, hotels and casinos in a safe, clean and comfortable environment! With seven stations located at MGM Grand, Bally’s/Paris Las Vegas, Flamingo/Caesars Palace, Harrah’s/The LINQ, Las Vegas Convention Center, Westgate Las Vegas and SLS Las Vegas, we’ll take you just about anywhere you want to go quickly and conveniently, with trains arriving every 4-8 minutes, Monday 7am-12 midnight, Tuesday through Thursday 7 am-2 am and Friday through Sunday 7 am-3 am. 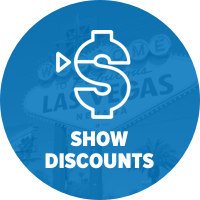 Cirque du Soleil Tickets: Cirque du Soleil Las Vegas shows include: Mystère™ at Treasure Island, “O™” at Bellagio, Zumanity™ at New York-New York, KÀ™ at MGM Grand, The Beatles™ LOVE™ at The Mirage and Michael Jackson ONE™ at Mandalay Bay. Blue Man Group Tickets: Blue Man Group will rock your world, blow your mind, and unleash your spirit. Leave your expectations at the door and let three bald and blue men take you on a spectacular journey bursting with music, laughter and surprises.